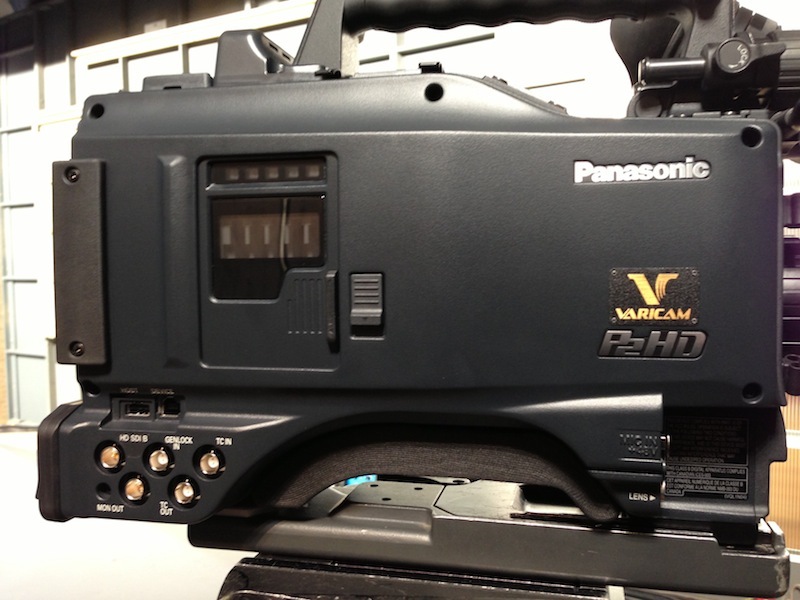 The Panasonic AJ-HPX2700 VariCam Camcorder is a high-end professional camera meant to replicate the warm and natural look and texture of film. Featuring a variable frame rate from 1 to 60 fps, in 720p, this camera enables you to easily under or overcrank your shooting for creative fast and slow motion effects. This camera's native effective resolution is 1280 x 720, but shooting is possible in a range of formats from 1080/60i to 720/25p due to the 3x 2/3" 1MP CCD sensors. A high F10 sensitivity supports low-light photography at 2000 Lux and a minimum illumination of 0.021 Lux. Recording is possible in AVC-Intra 100, AVC-Intra 50, and DVCPRO HD; 4:2:2 full raster sampling is supported in the AC-Intra 100 format. Selectable gamma modes further allow for realistic, film-like qualities by extending the dynamic range, lowering the overall contrast, and reducing the highlights within the scene. 14-bit digital processing with 12-axis color correction permit further fine tuning of the scene by manipulating certain colors and textures; such as skin tones. 3 large sensors combined with a digital signal processing circuit allows for high definition 1080 and 720 imagery. When filming in 720p formats, a variable frame rate of 1 to 60 fps is enabled, allowing for film-like quality and control over the resulting pictures. A high F10 sensitivity at 2000 lx is also available, allowing low-light filming as low as 0.021 Lux illumination. With the ability to photograph at 1 to 60 frames per second, this camera provides a variety of under and overcranking possibilities to produce slow and fast motion effects. This range of frame rates is available in the native 720p formats. The 14-bit A/D conversion system and digital signal processing provide a wealth of technologies for color correction and adjustment. A 12-axis color correction matrix enables you to finely tune specific color regions, such as skin tones and highlight regions. This functions helps to suppress blocked up shadows and blown out highlights that are common when photographing in high contrast areas or when moving from outdoors to indoors. The DRS function automatically utilizes an estimated gamma curve and knee slope to match the contrast of each pixel, resulting in a wider dynamic range with excellent gradation from the highlights to shadows. When used in conjunction with a compatible lens, this technology employs a sophisticated algorithm that compensates for blur and color shifts that are mainly caused by lens chromatic aberration. The resulting images from a CAC-enabled zoom lens more closely resemble those captured with a prime lens; free of image degradation. The camera is capable of using an ultra prime lens or anamorphic lens adapter for creating a 2.35:1 aspect ratio widescreen image without cropping. 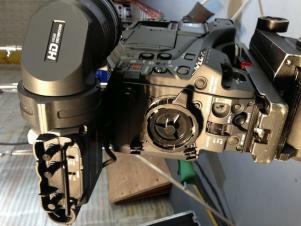 The scan reverse function cancels the image inversion that occurs when using an Angenieux HD lens adapter. When recording in the native mode, the camera only records in the frame rate selected; this allows for direct playback at the chosen speed rather than having to use a frame rate converter. P2 recording time is also extended when using the native mode. This mode employs a 2:3 pulldown to record 60 frames. This provides the same recording times as 1080i and 720p modes, but permits direct output of a DVCPRO HD stream through the IEEE 1394 while recording. This enables you to make a backup copy of the footage immediately for use with VTR systems, P2 Mobile, and P2 Gear recorders. When in 24p Advance mode, a 2:3:3:2 pulldown is applied to a 1080/24p recording mode in order to produce over 60i recording. This allows for compatibility with HD handheld cameras that use an HD codec. The built-in electronic shutter provides 7 different speeds up to maximum of 1/2000 second, a half mode, and an angle setting, for similar results compared to working with a film camera. When combined with the variable frame rate function, a wide variety of shooting techniques can be utilized. There is also a synchro scan function for use when photographing computer monitors. The AVC-Intra codec is a high quality and equally efficient codec for HD video production. Two modes are supported: AVC-Intra 100 for full HD (1920 x 1080 and 1280 x 720) images and AVC-Intra 50 for lower bit-rate, more economical recording. Both modes are compliant with the MPEG-4 AVC/H.264 standard for compression and image quality. These modes record with intra-frame compression for greater versatility when editing. · AVC-Intra 100: This mode records with the same 10-bit rate as DVCPRO HD and enables high quality 1920 x 1080 recordings. · AVC-Intra 50: This mode produces results similar to DVCPRO HD, but with bit rates that are more akin to standard definition recording. When recording in this mode you are afforded twice the amount of recording time per P2 card and less storage is required for editing. Conventional DVCPRO HD recording is also supported for greater flexibility amongst numerous applications and system environments. 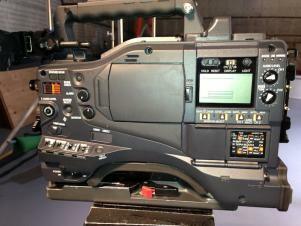 It also enables a fluid transition from existing VTR VariCam systems and older platforms. 48 kHz/16-bit digital audio recording is supported on all 4 audio channels; and you can easily select the audio source for each channel independently. A 5-pin XLR jack with 2-channel compatibility is used for the front mic input. When all 5 P2 card slots are utilized, up to 800 uninterrupted minutes of 1080/24p content can be recorded. Other benefits of P2 card recording include the opportunity to switch cards while recording; select specific cards to record to; loop recording to specific, fixed areas of the card; pre-record up to 8 seconds when in standby mode; record intermittently based on set interval times; one-shot recording for use when filming animations; and record review for a quick playback check of the final seconds of the recently finished clip. For each clip you film, a thumbnail is automatically generated for easy navigation through different clips. You can view thumbnail images on the built-in 3.5" / 8.9cm LCD or on a separate display. Clips can be controlled in playback, deleted instantly, and you can also select a number of clips for seamless playback together. While recording or previewing a clip, you can press the Text Memo button and create a text label or bookmark for noting certain parts of the footage. Text can be entered into each memo with the camera or with a PC using P2 Viewer. You can also create a new clip with data copied between text memo labels, using the camera itself. There are also shot marks for simple OK and NG markings, when more text is unnecessary. There is a built-in SD/SDHC memory card slot for copying metadata files containing important information such as the camera operator, locations, text memos, and backups of the photography metadata. The memory card slot is also used to transfer firmware updates and to upload different scene files. Up to 16 different scene files can be stored within the camera, and up to 8 more on a SD/SDHC memory card, that record specific camera settings for quickly returning to a previous setting. 64 lens files can also be stored in-camera, and 64 more on a memory card, for programming settings on a variety of interchangeable lenses. There are also 5 programmable user buttons that allow you to choose from a variety of settings to have accessible by pressing a button. The focus assist function provides an objective comparison of the incoming frequency distribution signal and portrays it in graph for in the viewfinder and LCD monitor. There is also a variable color temperature adjustment dial and switchable color bar for controlling the look of the scene around you. 2-level zebra and a variety of marker settings are also available. The built-in 2-layer optical filter contains a neutral density layer (clear, 1/4 ND, 1/16 ND, 1/64 ND) and a CC layer (3200K, 4300K, 5600K, and 1/2 ND). By having the 1/2 ND filter on the CC layer, finer aperture adjustment is enabled. The innovative grip handle design incorporates 5 threaded holes for mounting a variety of accessories directly to the camera body. The interface of the camera features an intuitive switch and dial layout for maximum efficiency as well as a 3-point locking viewfinder with color viewfinder compatibility. The audio adjustment features can be manually locked, switched on/off, and allocated to the desired channels. 2 dedicated HD SDI output terminals are integrated that also comply with 1080/24PsF standards and include embedded audio. 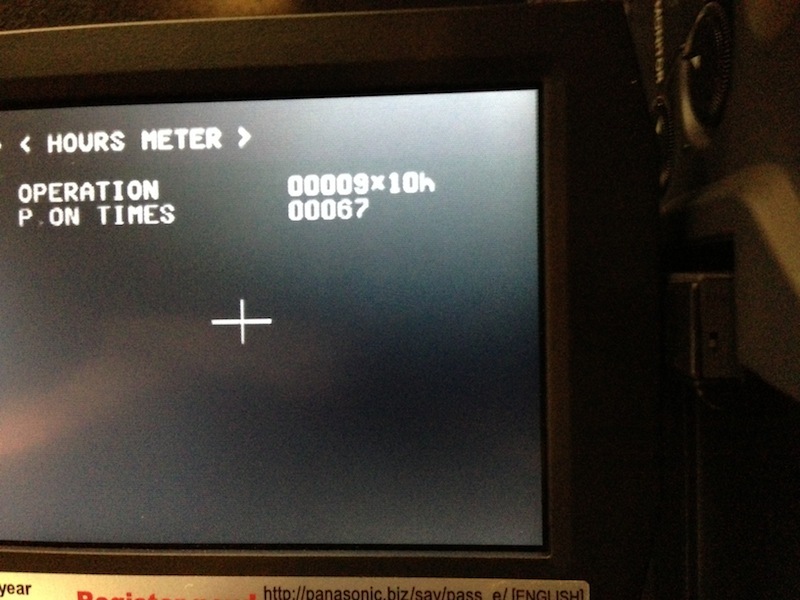 Additionally, an HD SDI video signal can be output from the MON OUT terminal. 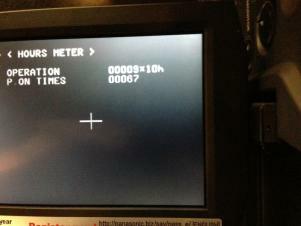 Character and marker displays can be set separately for both HD SDI and MON OUT terminals. The output signal from the MON OUT terminal can also be switched to VBS, which will output a down-converted SD video signal (analog composite). When used in conjunction with a compatible recorder, this camera can make degradation-free back-up recordings in the DVCPRO HD codec via the 6-pin IEEE 1394 DVCPRO output terminal. 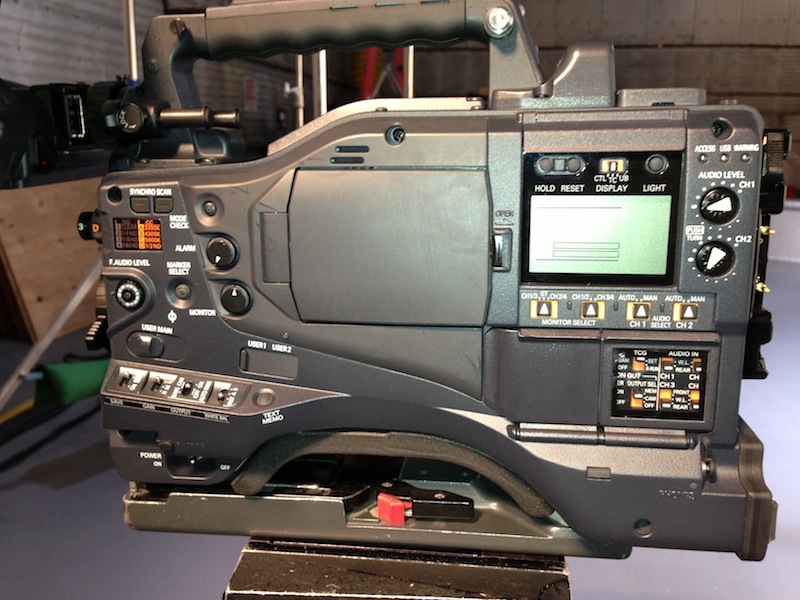 When in device mode, the camera's P2 card slot can be used to connect to a PC as an external device for nonlinear editing and transmission over networks. When in host mode, files from the P2 card can be transferred to a hard disk without the use of a PC. The DC OUT terminal can be used for remote start/stop recording control when connected to an external switch, or as a tally lamp when connected to an LED. 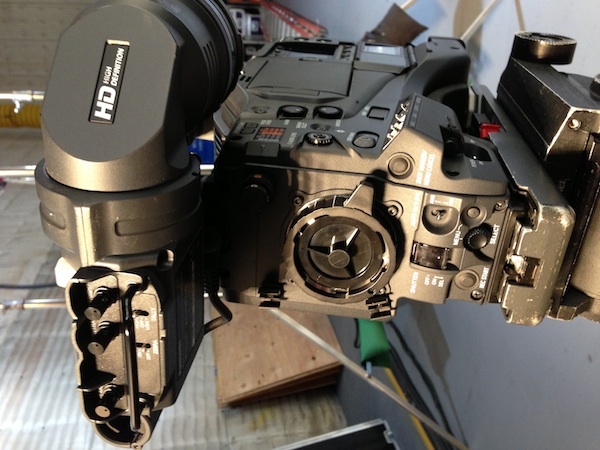 This multipurpose functionality is ideal for use when the camera is mounted to a crane or out of immediate reach. An RCU terminal allows for the use of an optional remote control system, such as the AJ-RC10G, for image and recording control while viewing the camera's image on an auxiliary monitor.